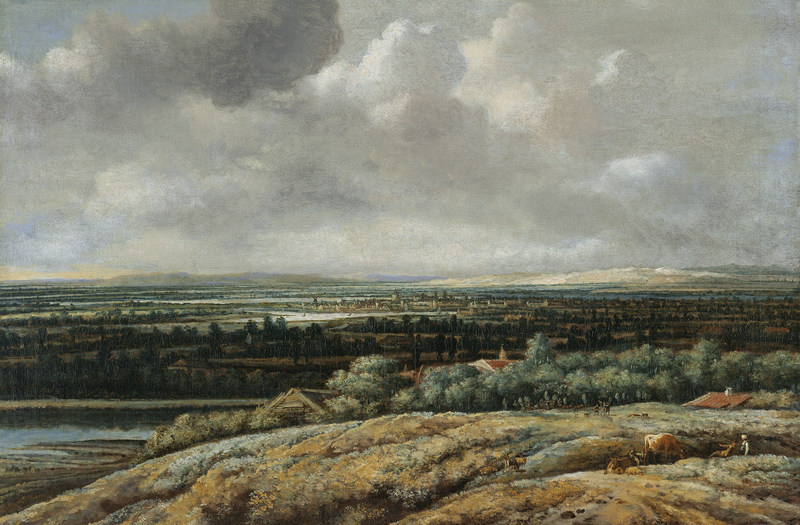 Landscape was a leading genre in 17th-century Dutch painting. During that century Dutch artists succeeded in formulating a type of representation that allowed them to depict the world around them in which their daily activities took place. The importance that they conceded to the landscape and their appreciation of the countryside as a place of leisure lay at the heart of the new appreciation for landscape painting and are important factors that should be borne in mind when analysing the growing autonomy and evolution of this genre. Over the course of the century, Dutch landscape painting evolved to an enormous degree while the number of artists working in this genre and the large body of work that they produced need to be understood as a response to the popularity of this genre. However, this popularity could only arise within a free market with a high demand for such paintings, which were accessible to a growing middle class and not just to the wealthiest sectors of society. The precedents for landscape as an autonomous genre are to be found in miniatures in Books of Hours, in the detailed views that early Netherlandish painters incorporated into their compositions and, by the 16th century, in the work of artists such as Patinir and Pieter Bruegel. In their compositions, particularly those of Patinir, the figures are merely accessory elements that give the paintings their titles while the true protagonist is the background. In the 19th century this canvas belonged to Pavel Pavlovich, Prince of San Donato, whose collection was housed in his palace near Florence. It was reproduced in an article by Leroi published in 1880 on the Prince’s collection. In 1880, five years before the Prince’s death, the canvas was auctioned with other items and was acquired by Adolf J. Bösch for his collection at Oberdöbling, Vienna. It was later with Charles Sedelmeyer in Paris, with James Simon in Berlin, and with Jacques Goudstikker in Amsterdam. It was acquired from Goudstikker by Hans Thyssen-Bornemisza for his collection in 1928. Koninck’s early works reveal the influence of artists such as Rembrandt and Hercules Segers. By the late 1640s he had formulated his own style and produced his finest works between the 1650s and mid-1660s. Koninck was responsible for inventing the panoramic view, a format that is considered to be one of the most original contributions to landscape painting, while the artist is considered to be one of the leading representatives of classic Dutch landscape painting. His subjects, including the present Panoramic View with a City in the Background, are based on the lowlands of Gelderland although it has not been possible to identify any specific location. Koninck used horizontal formats for these large compositions, creating the horizon with soft lines that divide the surface into two clearly defined areas, all presented from a high viewpoint. The artist realised his finest works in 1654 and 1655 and the present work dates from the latter year. Koninck constructed his composition using a foreground of gentle hills, precisely illuminated and painted with a lively brushstroke. The sense of depth is created through horizontal strips of water, land and trees that alternate in compact areas of light and shade. To increase this illusion of depth in the background planes, Koninck used a loose, flowing brushstroke that contrasts with the tighter handling of the foreground. The horizon line is so subtly conveyed that it is difficult to tell where the hills, sky and land begin and end and the artist obtains atmospheric effects of the highest quality. In this canvas Koninck abandons devices used in earlier works that were intended to lead the eye into the landscape, such as a path that begins in the foreground or which surrounds and isolates various elements. Overall, this canvas reveals the extremely high level of technical skill that Koninck was capable of achieving. The canvas has been compared to others of the same date in which Koninck experimented with different motifs to create a sense of spatial recession. They are Landscape with a Path next to a River in the National Gallery, London, Panoramic Landscape with a Windmill belonging to the Trustees of the Firle Estate Settlements, Firle Place, Lewes, Landscape with Farmhouses and a Path in the Rijksmuseum, Amsterdam, and Panoramic View in the Muzeul National Brukenthal in Sibiu, Rumania.